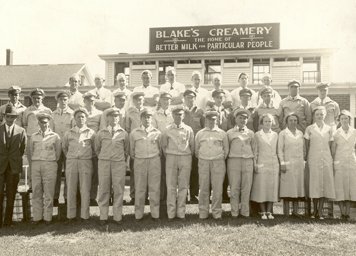 Blake’s Creamery was founded in 1900 by Edward Charles Blake. Since then, Blake’s has continued to operate as an independent company located in Manchester, NH. Quality products and services have earned Blake’s an outstanding reputation as well as many loyal customers throughout its 115 year history. 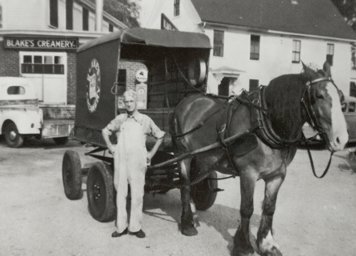 In the early years, milk was supplied by farmers to Blake’s receiving stations in East Haverhill NH where it was then trucked to Manchester NH for processing. During the war years, Blake’s delivered milk to homes and businesses using horse drawn wagons as well as trucks due to the rationing of gas. In 1963, Blake’s opened its first restaurant, located at 353 South Main Street – the site of the milk processing plant and office. The menu included light lunches as well as premium ice cream produced in small batches in the restaurant. With the increase in competition from large dairy corporations, Blake’s closed down its milk processing operation and became a full line dairy distributor in 1984. In the same year, a new ice cream plant and storage freezer were built on the property. Our 14% premium ice cream continues to be produced using many of the original formulas and always with the highest quality ingredients availalble. Today, the company produces over 80 flavors of premium ice cream, frozen yogurt, sherbet and sorbet. Blake’s ice cream is not only sold wholesale in New Hampshire, but throughout parts of New England. Also, Blake’s Creamery continues to operate two restaurants at 353 South Main Street and 53 Hooksett Road in Manchester NH, servicing breakfast, lunch, dinner, and of course ice cream.